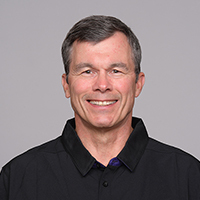 Pat Moriarty is the Senior Vice President of Football administration for the Baltimore Ravens. A former Running Back at Georgia Tech and later the Cleveland Browns, Pat is one of the NFL’s original “capologists”. Pat is responsible for the management and strategic planning of the team’s salary cap, player negotiations, roster management and day-to-day player operations. Pat serves on the NFL Management Council’s Working Club Executive Committee and the Board of Advisors for the University of Baltimore School of Law.